Upper cabinets don’t come in one height or width, and they don’t come in just one depth either. 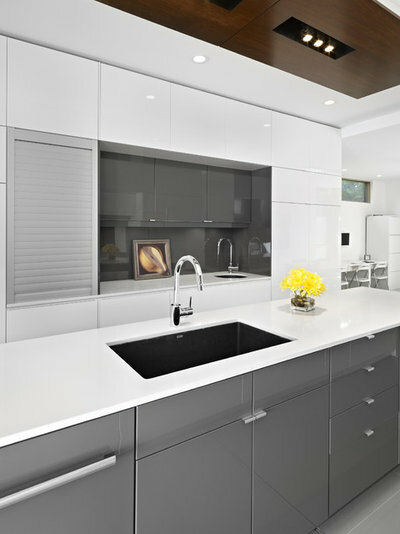 Typically, upper cabinets are much shallower than lower cabinets, sometimes by as much as half the depth. 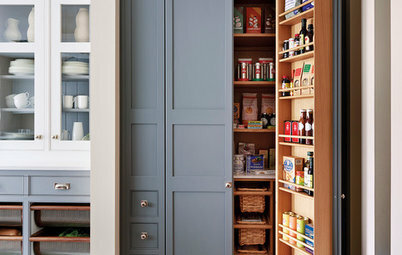 That’s some serious space you’re missing out on if you’re looking to squeeze every inch of storage out of your kitchen. Here’s why you might want to consider going deep with your upper cabinets. What Are Counter-Depth Upper Cabinets? 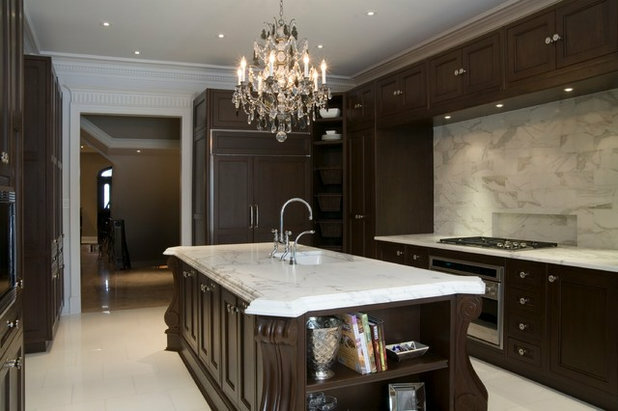 In a typical kitchen, we think of upper and lower cabinets as being distinctly different, particularly when it comes to the depth. Lower cabinets along a wall are typically about 24 inches deep, with a 25-inch deep counter on top of them. Upper wall cabinets are more shallow at 12 to 15 inches so as to not encroach upon the workspace too much. But with most cabinet lines it’s possible to use “counter-depth” or “full-depth” upper cabinets, which are the same depth as typical lowers. In the same kitchen as the previous photo, this angle reveals that the espresso cabinets are all one depth. Using deep uppers can have a variety of functions, the most basic being to provide more storage space. 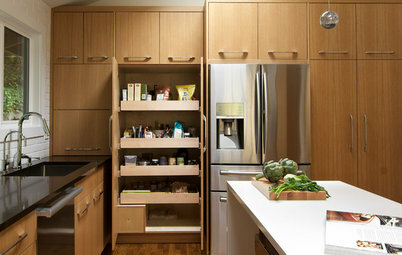 In a compact kitchen, every inch of storage helps, and counter depth cabinets give you about 10 inches more storage. That can go a long way. In the examples so far you can see that short but deep uppers are paired with a row of standard-depth uppers, which gives the best of both worlds. The deep uppers are well above the countertop, so the view is not blocked when cooking, and the standard-depth lowers can hold smaller items for quick access. 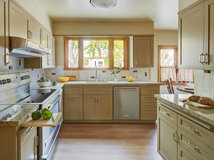 Counter-depth uppers also make sense in a kitchen with an ample island to serve as the main work space. 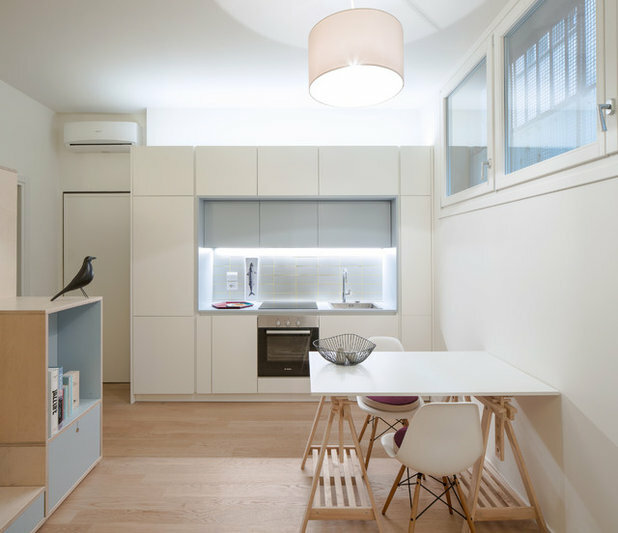 You can see in this kitchen how the back wall serves as mostly storage, with just a minimal opening around the range. 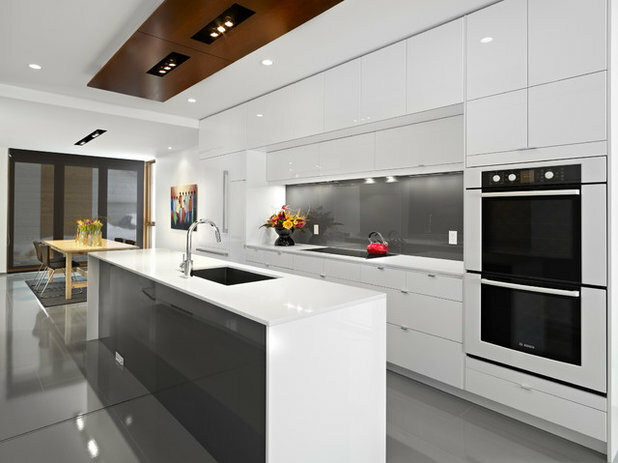 The range hood and few upper cabinets are all one height and depth, giving this modern space a very clean-lined and tidy appearance. 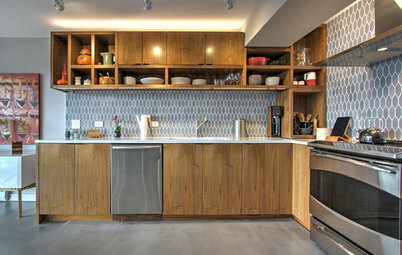 Another great use for deep upper cabinets is on a short wall in an L- or U-shaped kitchen. 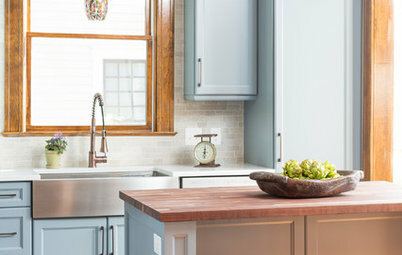 As you can see here, the deep uppers over the counter leave a perfect nook for stashing small appliances or other countertop items, while the other two sides are the more functional counters for prepping and cooking. While the spaces we’ve looked at so far have all been fairly modern, this idea can work well in traditional or transitional spaces too, as in this example I designed for a client in Toronto. 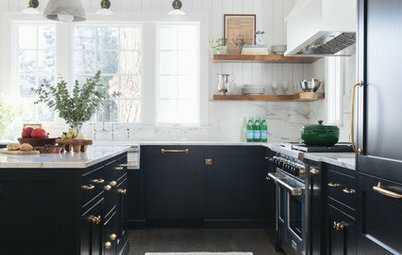 It’s important, however, to consider that deeper upper cabinets will automatically appear a bit more “heavy” and can shrink the appearance of the space, so you’ll want to find some ways to lighten the overall appearance. 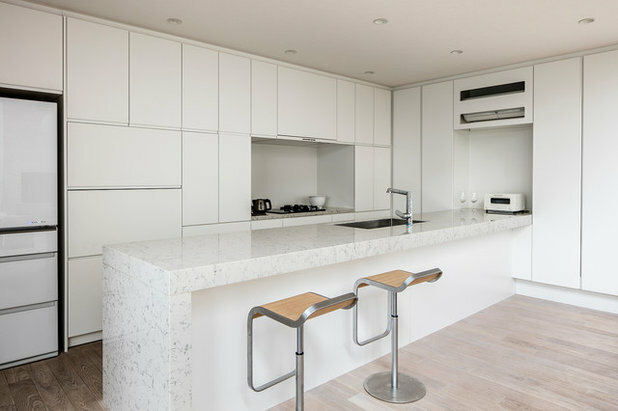 Using lots of white always helps a kitchen feel more seamless and open, especially when it’s the finish for the cabinets themselves. 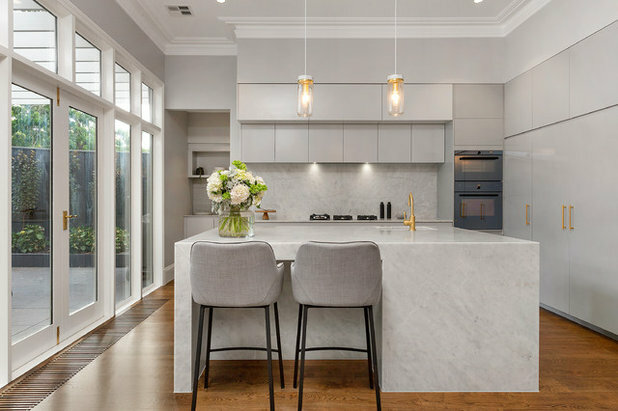 In this example the white upper cabinets and white ceiling blend together to de-emphasize how large the cabinets are, giving the whole room a light and airy appearance. 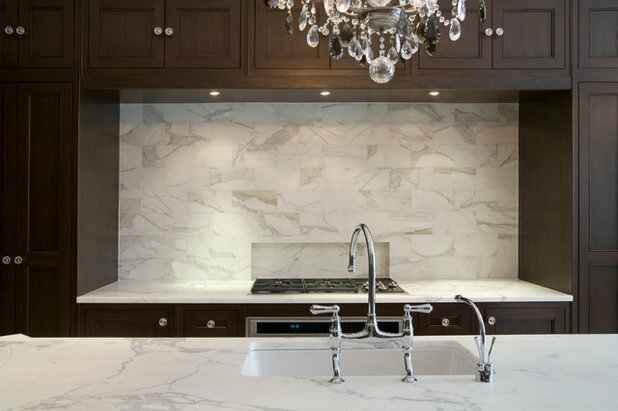 Going back to the traditional example, the cabinets are a rich wood tone, but lots of white is incorporated through the other finishes, such as the counters and backsplash. 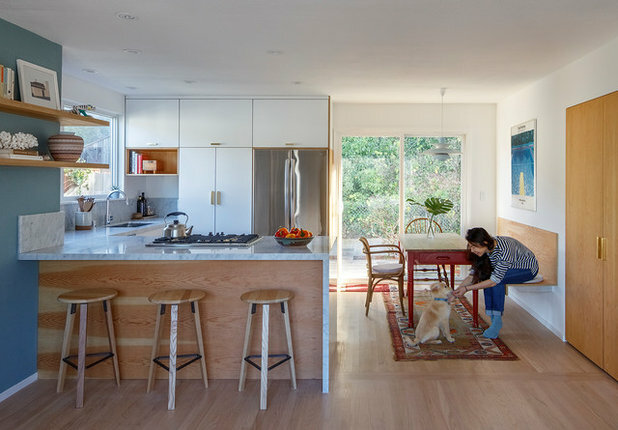 The cabinets feel weighty and mature, but the overall space still has some visual breaks for good balance. 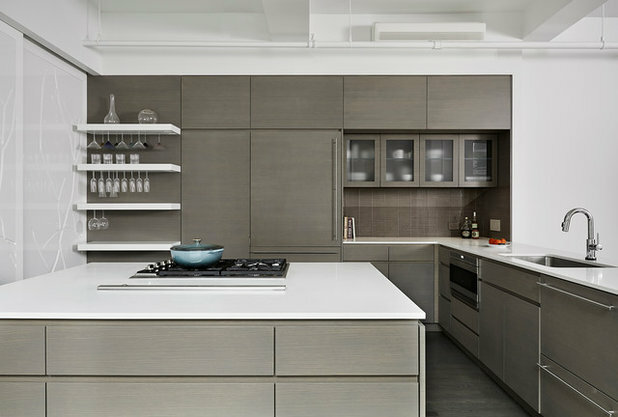 In this example, the deep upper cabinets are matched to the white on the wall so they almost appear as part of the bulkhead above, with the other cabinets all dressed in a soft gray. 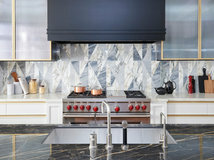 The effect is subtle, but it appears almost as if the deep upper cabinets don’t even exist, with just an elegant and breezy kitchen meeting the eye. 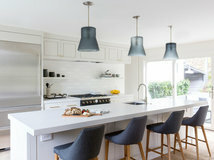 Bright undercabinet lights will make the open area above the counter feel larger. 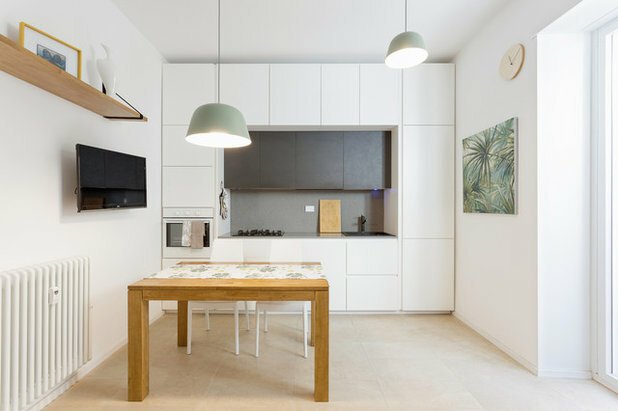 They also create a focal point a little lower down on the wall, so your eyes are drawn to the most open area instead of up to the bulkier cabinets. With all the deep cabinets available for functional items, using just a few short glass-door cabinets gives you a good place to stash cups, bowls and mugs to make an attractive display that doesn’t have to be too thought out. The glass doors make the area feel less closed in and provide an interesting contrast, once again balancing the visual heaviness of the deeper uppers. Like glass door cabinets, floating shelves balance the heaviness of deep upper cabinets with open storage. The upper cabinets will be most useful for large items or pieces you don’t access often, so it makes sense to have some shelves available below for pieces you might want to grab quickly, like salt and pepper or other cooking supplies, or daily essentials like glassware. 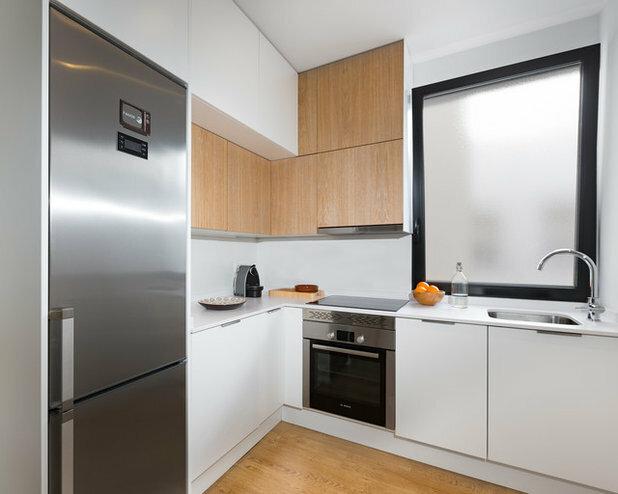 In this example the shelves are in a stainless steel finish that gives a little extra hint of gleaming metal, a finish that could feel like too much for some to live with on cabinet doors but feels just right in a small dose. 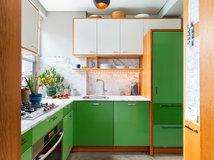 Many of these examples use a two-tone cabinet look, which is also a fun way to add personality to a space. 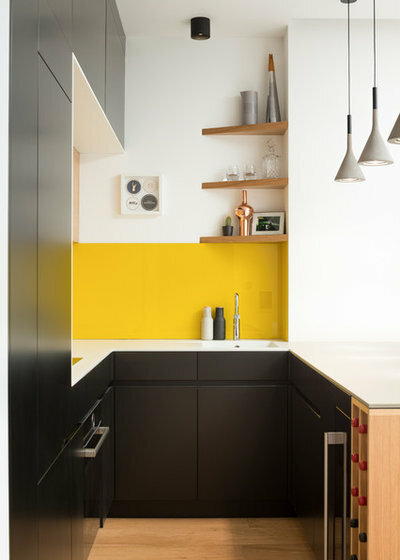 As a general rule, it’s a safe bet to use the same finish for the deep uppers and the lower cabinets, and save a contrasting material for standard depth uppers, for a look that is playful but still logical and put-together. 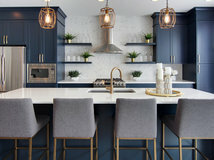 However, if you have a larger kitchen, you can also try using a single material for the upper cabinets and pantry cabinets, and a second material for the remaining “standard” cabinets. 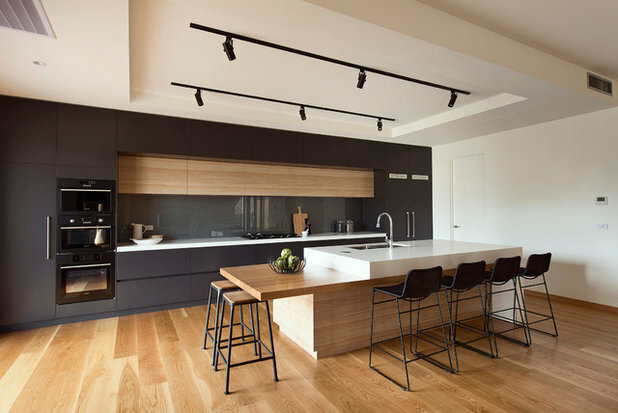 Notice how in this kitchen the material palette is mostly limited to a single wood tone and crisp white so the look doesn’t become chaotic. 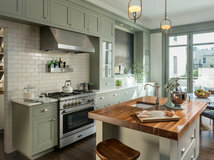 Similarly in this example, the “accent” cabinets in the middle complement the wood tone to the floors and island counter extension, so the palette doesn’t get muddy. You can see how the lower cabinets, tall cabinets and deep uppers don’t give a natural breaking point to change materials, so they look best as one seamless plane in charcoal. 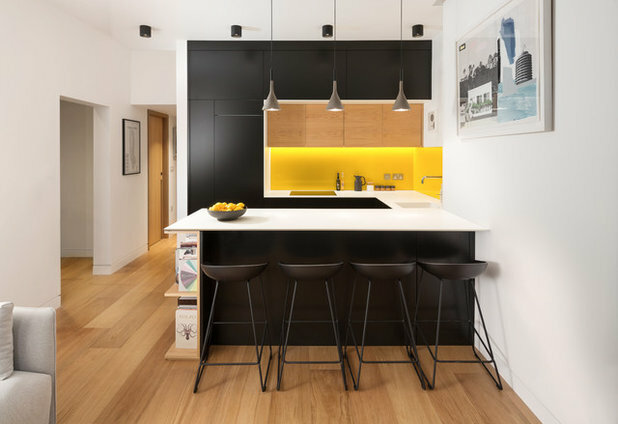 So if you’re planning a kitchen renovation or new build, before you commit to the typical layout, ask your kitchen designer or cabinet maker what other creative combinations could work for your space. You may be surprised how many options exist. 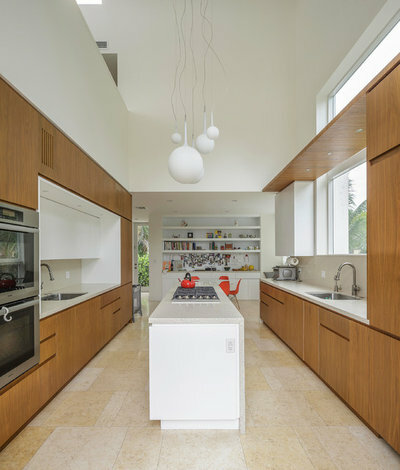 Sasha - you go girl - nicely done - the key to using pre-mades is to design the space to the cabinets and use a couple over many times. Sure cuts down on the ordering time. 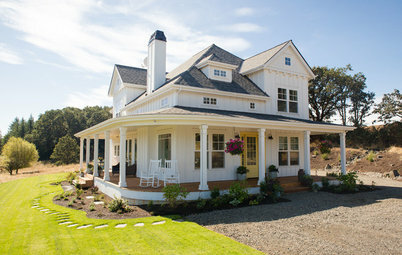 The mistake is to design and then find the cabinets to fit the custom design. The decision to use pre-mades should be made very early on in the project in my experience. In this case you put the cart before the horse and the horse (cabinet layout) pushes the overall design. Would you consider adding some photos with "people elements"? A vase of red or black roses? Some cooking favorites at the back of the counter. Monica Difranco......did you meant 18” deep uppers? Or do you mean 18” wide? nsc6 -- Thank you very much. 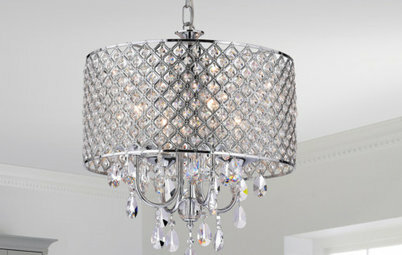 The three uppers are 18 inches deep and 30 inches wide each. The lower drawers are 24" deep and the quartz countertop sticks out another inch. So the uppers are set back seven inches from the front of the counter. I use that area for showcasing souvenirs from our travels and for holding pretty glass containers, a cookie jar, a fruit bowl and a knife block. I don't use it for food prep because I have an island as well as counter space on either side of both the sink and the cooktop. So I don't have to worry about bumping my head while chopping or anything. It was one of the best decisions I made. 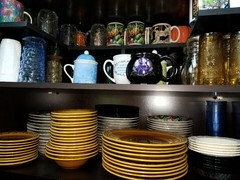 I can fit so many dishes, bowls, platters, etc., in those cabinets that wouldn't fit in the ones they sell as 12" deep (which are actually only about 10-1/2" of usable space). 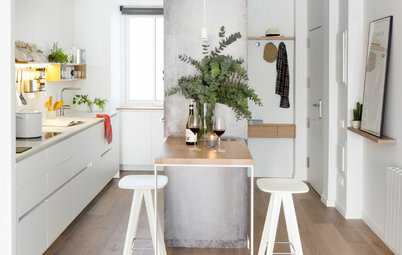 Kitchen Design How High Should You Hang Your Upper Kitchen Cabinets?